Enzyme Modifications for Nuclear Magnetic Resonance Studies: J.T. Gerig, Fluorine Nuclear Magnetic Resonance of Fluorinated Ligands. D.M. LeMaster, Deuteration in Protein-Proton Magnetic Resonance. D.C. Muchmore, L.P. McIntosh, C.B. Russell, D.E. Anderson, and F.W. Dahlquist, Expression and Nitrogen-15 Labeling of Proteins for Proton and Nitrogen-15 Nuclear Magnetic Resonance. D.W. Hibler, L. Harpold, M. Dell'Acqua, T. Pourmotabbed, J.A. Gerlt, J.A. Wilde, and P.H. Bolton, Isotopic Labeling with Hydrogen-2 and Carbon-13 to Compare Conformations of Proteins and Mutants Generated by Site-Directed Mutagenesis, I. P.A. Kosen, Spin Labeling of Proteins. Protein Structure: K. Waduthrich, Determination of Three-Dimensional Protein Structures in Solution by Nuclear Magnetic Resonance: An Overview. V.J. Basus, Proton Nuclear Magnetic Resonance Assignments. M. Billeter, Computer-Assisted Resonance Assignments. I.D. Kuntz, J.F. Thomason, and C.M. Oshiro, Distance Geometry. R.M. Scheek, W.F. van Gunsteren, and R. Kaptein, Molecular Dynamics Simulation Techniques for Determination of Molecular Structures from Nuclear Magnetic Resonance Data. R.B. Altman and O. Jardetzky, Heuristic Refinement Method for Determination of Solution Structure of Proteins from Nuclear Magnetic Resonance Data. I. Bertini, L. Banci, and C. Luchinat, Proton Magnetic Resonance of Paramagnetic Metalloproteins. H.J. Vogel, Phosphorus-31 Nuclear Magnetic Resonance of Phosphoproteins. J.A. Wilde, P.H. Bolton, D.W. Hibler, L. Harpold, T. Pourmotabbed, M. Dell'Acqua, and J.A. Gerlt, Isotopic Labeling with Hydrogen-2 and Carbon-13 to Compare Conformations of Proteins and Mutants Generated by Site-Directed Mutagenesis, II. Enzyme Mechanisms: D.G. Gorenstein and C.B. Post, Phosphorus-31 Nuclear Magnetic Resonance of Enzyme Complexes: Bound Ligand Structure, Dynamics, and Environment. C.R. Sanders II and M.-D. Tsai, Ligandb1Protein Interactions via Nuclear Magnetic Resonance of Quadrupolar Nuclei. P.R. Rosevear and A.S. Mildvan, Ligand Conformations and Ligand*b1Enzyme Interactions as Studied by Nuclear Overhauser Effect. B.D. Nageswara Rao, Determination of Equilibrium Constants of Enzyme-Bound Reactants and Products by Nuclear Magnetic Resonance. J.M. Risley and R.L. Van Etten, Mechanistic Studies Utilizing Oxygen-18 Analyzed by Carbon-13 and Nitrogen-15 Nuclear Magnetic Resonance Spectroscopy. J.J. Villafranca, Positional Isotope Exchange Using Phosphorus-31 Nuclear Magnetic Resonance. J.J. Villafranca, Paramagnetic Probes of Macromolecules. In Vivo Studies of Enzymatic Material: S.M. Cohen, Enzyme Regulation of Metabolic Flux. J.S. Cohen, R.C. Lyon, and P.F. Daly, Monitoring Intracellular Metabolism by Nuclear Magnetic Resonance. Appendix: Computer Programs Related to Nuclear Magnetic Resonance: Availability, Summaries, and Critiques. Each chapter includes references. Author Index. Subject Index. 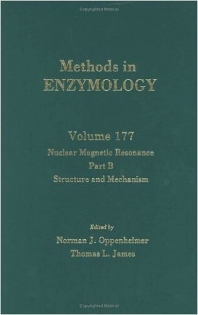 This volume, as does Volume 176, provides a general background of modern NMR techniques, with a specific focus on NMR techniques that pertain to proteins and enzymology, and a "snapshot" of the current state-of-the-art in NMR experimental techniques. These books enable the reader to understand a given technique, to evaluate its strengths and limitations, to decide which is the best approach, and, finally, to design an experiment using the chosen technique to solve a problem. Biochemists, organic chemists, analytical chemists, biophysicists, physical chemists, and drug company researchers.